Discussion in 'Music Corner' started by wolfram, Jun 22, 2017. I know that there already is a thread on this, but it's already 66 pages long and the first half is about the "4Ever" compilation and the rest is speculations about the upcoming release. For me this "Purple Rain" release is a big deal and I think it deserves its own thread. So this thread is for discussing the actual release, which many of us will get in the coming days (I will have mine on Sunday, I hope). Please post your impressions here, so we have a future reference thread. CrazyCatz, dee, bob60 and 10 others like this. I went straight to the outtakes disc, because I assume that's what the most of us really want to hear. I'm glad we can finally have Computer Blue, We Can **** and some of the other songs in this quality, though it's compressed and over peaked. The material is great, though I could go without Velvet Kitty and Katrina's Paper Dolls. So do you have the CDs already? Or are these leaked? Either way, the news so far are not what I was hoping for, but I'm anxious to hear it for myself. I went straight to the outtakes disc, because I assume that's what the most of us really want to hear. I'm interested in all of it. A good remaster of "Purple Rain" and the extended versions is at least as important to me as the outtakes. I'm also psyched about the DVD. Splungeworthy, andrewskyDE, TonyCzar and 2 others like this. I'm kind of behind on this news, but is there a vinyl version planned? I think the original CD sounds fantastic. They'll be hard pressed to improve on it. Audioresearch, klockwerk, saturnsf and 7 others like this. It leaked yesterday. The album disc is sadly DR5-6, the second and third one DR8-10. Personally, I don't care about the actual remaster, as I think the original cd sounds fine enough. You can't improve already badly recorded album and remember that Purple Rain had leakage and noise issues all over the floor. ribonucleic, Daniel Thomas and FJFP like this. Yes, the original sounds fine, but I wouldn't mind a mastering with a bit less treble and a bit more bass. I heard a vinyl rip of the 2009 mastering which goes in that direction and was hoping for something like this. I ordered the deluxe edition, which is supposed to arrive tomorrow. I've read mostly negative reports about the sound quality of the remaster from people who have received their copies already. I'm mostly in it for the disc of unreleased tracks. It will be nice to have official versions of these songs. I'm waiting to hear the first reports about the vinyl release. Will it be better than the CD version of the remaster? Amazon says that mine won't be delivered until June 29th, so I wait and wonder. Expecting my copy of the CD + DVD tomorrow. Have low expectations of the remaster of the actual album (but would normally play this on vinyl in any case), and will, as suggested above, be rushing to rip and play the second disc and in particular 'Computer Blue'. So you don't actually have the physical discs in hand...correct? Kevin55 and Grant like this. If you bought it on Amazon it includes "Autorip", so you can just download it directly from them and listen until the physical copy arrives. I believe that'll just be for the CD portion though, so you'll have to wait for the DVD to watch the Syracuse show. Of course, this doesn't always mean they'll use the remastered version for Autorip... Sometimes they'll just stick the standard version in. I've got some very strange things in my Autorip collection that bear little relation to what I've actually purchased! Thwacko, snowman872, Mr.Sean and 6 others like this. Hopefully tomorrow a delivery will come with the vinyl and the 3CD1DVD set. I would of liked a 3LP vinyl edition of the album and the outakes, but not to be. I'm not expecting to be blown away by the album with this new edition. My 1984 original sounds grand, but it would be nice to hear something genuinely different. I have other copies too, such as the Japanese vinyl, the SHM-CD and the recent Kevin Gray cut. 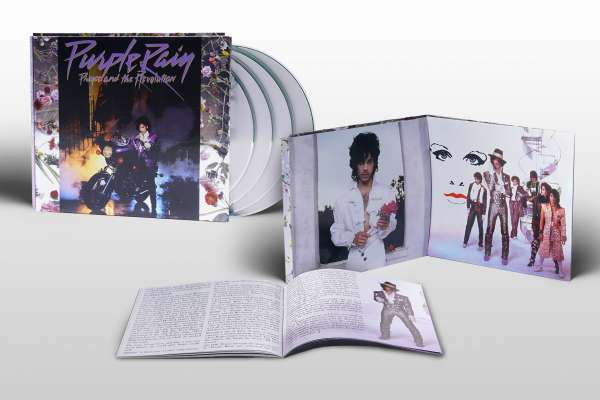 Purple Rain is the album I own most copies of! The outtakes and the concert will get the most attention tomorrow. Concert really needed to be on Blu-Ray, its a smoother experience all round on BR than DVD disc these days. Still, as a UK resident and in PAL speedup land, it will be nice to actually hear the concert at the right pitch. Its been a long time since I've seen it, a very long time! Now, Robert Smith, where is The Cure in Orange....? Someone said the proper album was a remix. Can anyone here who actually has the CD check the liner notes and confirm this? Also, can anyone who actually has the CD rip a few tracks and tell us if limiting, or excessive limiting was used? That didn't take long. A comment like this should just be auto-populated into every thread started here about a new reissue. Christopher B, majorlance, Londonmay1 and 14 others like this. I think someone mentioned that concert audio (DVD) is remixed. This record changed my life when it came out. I've heard it countless times. I've owned multiple copies of the LP, CD and Cassette. Have the concert vhs still too. I would love a remaster that betters the original and find it sad we're already aware the new remaster is badly reviewed before it arrives. I hope it's better and more enjoyable than everyone is saying. I have the 7" and 12"s too and still had high hopes this set would be revealing in some ways. Shak Cohen, ad180 and JDeanB like this. I read a post that said something was a remix, but they didn't specify what it was they were referring to. This is one thing that annoys me about this place is that people always assume that everyone knows what they are talking about. Another thing that is quite annoying is when two or more conversations about an album take place in the same thread. This got really bad in the Sgt Pepper thread where you had discussion of the vinyl, CD, and 5.1 remix rolled all into one, and some people didn't bother to specify what it was they were referring to. Auggghhh! groovelocked, Summerisle and FashionBoy like this. From all reports I've heard, the sound is better (it was remixed...) but the video is no better than the bootlegs circulating. What's wrong with the comment? The original IS a great sounding CD and from everything I've heard so far the remaster most definitely hasn't improved on it! OptimisticGoat, Diablo Griffin, Yost and 3 others like this. Actually, from what i'm hearing, the remaster adds a much, much needed punch. On lows especially.